Reagan’s Bedroom is one of my favorite makeovers I have ever done. I think because for half of the creating and planning for it, we were not even in our new house yet. I learned a lot about trying to create for a space that you don’t get to walk by and stand in everyday to imagine and “see” your project come to life. I was stretched and now have made something I am proud of as a result. If it was my choice, we would play in there all day everyday. Although she may only be two, it is something Reagan is proud of as well. If you were to walk into my house right now, she would ask you to come upstairs and see her room…even if you have already seen it. It makes my heart so happy. Some work might have been required, but what an easy way for me to show love to my daughter by being able to create something she loves. 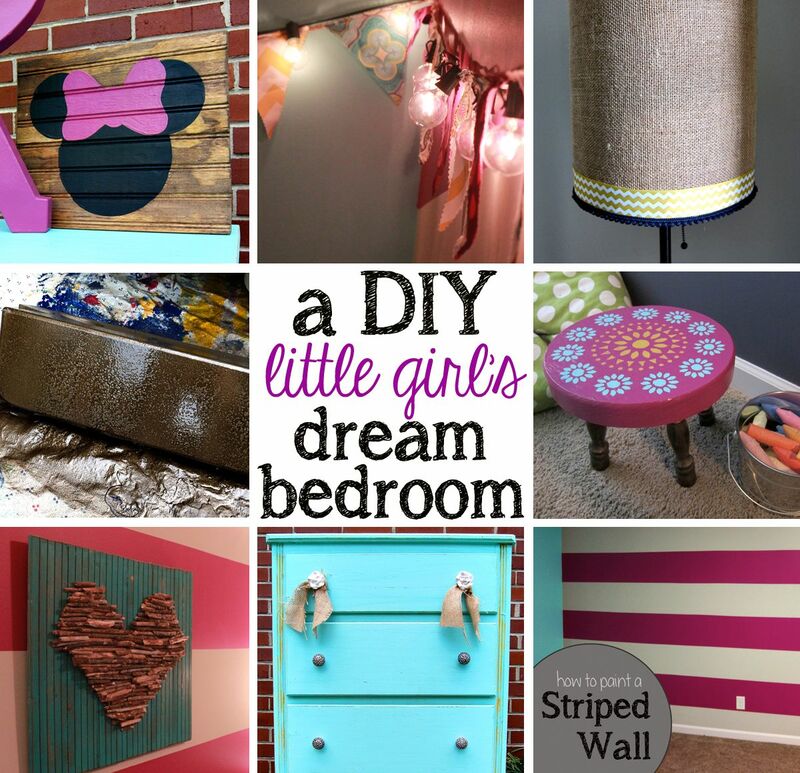 Since before we moved, I have been showing tutorials and DIY projects that I have been creating to incorporate in her room. I thought it would be helpful to put all those in one place, so there is a little summary of how create this room. Please feel free to bookmark it, pin it, or share it. It is my hope all these hours of creating can inspire others to create as well. It’s so nice to have all these links in one place! Many of these projects are some of my favorites, and I am so glad I can give you this summary. A few other items that I have incorporated into this room are shown below. Thank you so much for checking out my little girl’s bedroom summary! I hope these links and posts can help inspire you. Please feel free to contact me, if you have any questions about how to do any of these tutorials! you are ‘inspiring-ly’ creative, well done! I will try the buntins my only challenge is the light bulb cord. Did u get a cord that had bulbs or you attached them yourself?